Actually if want to make Teriyaki, we have to marinate the beef with the teriyaki sauce first. but since I didn’t have time to do it. I prefer to boil the beef first so that it won’t take long time to cook the teriyaki. When it’s already done, slice the beef into small pieces depend on your desire. Slice the cabbage, garlic, onion, and the tomatoes. smash the ginger and slice it small. Fry the onion, garlic, ginger, and pepper in hot plate with sesame oil on it, and stir it until it smells good. add the sliced beef and pour the kikanom oil (mirin), soy ketchup, and lemonade water (to eliminate the beef smell). then add the sugar and salt… and taste it. After that add the cabbage and the water, then the sliced tomatoes. and wait until everything’s done and taste it. And Voillaaaaaaaaa…. 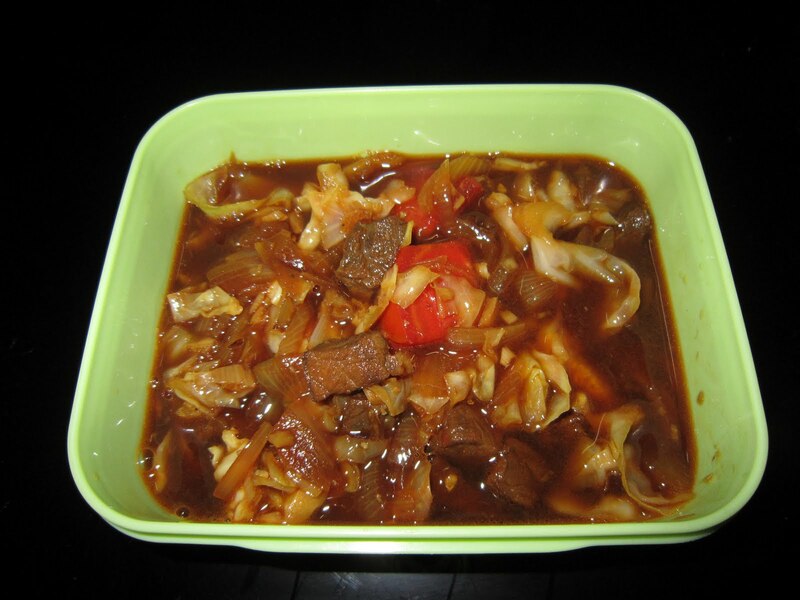 Cabbage Teriyaki with Beef (hehehhehe.. so proud with this masterpiece.. wakakkakkaka), actually the taste little bit look like the Tongseng.. but quite different hehehhe….